As I write this post, there is conflict on the borders of Israel. It is hard to divorce the tragedy of lost lives from the experiences of a vacation. It is also what makes a trip to Israel so different than any other visit. There are always eyes to be opened and questions to ask. A country of 8.5 million people, the size of New Jersey survives in an atmosphere of both unrest and peace. My recent trip to Israel with husband Bill was a meaningful journey on so many levels. I never really understood what people meant when they returned, transformed and in love with the country and its people. Now I do. One theme song for our trip were the words, “It’s complicated.” That is true for a lot of what happens in Israel. 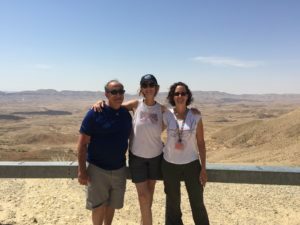 We were accompanied by our smart, warm and flexible guide, Yael who shared many heartfelt stories, history, and political insights that deepened our understanding and respect for a place we knew little about. Because I study introverts, when I travel, I naturally seek out examples of introversion. I have found that a culture can influence how introverts express themselves. For instance, Asians value the introvert preference for quiet time and Australians love to extrovert and talk, talk and talk. “On the surface, Israelis may often seem rude, pushy and inflexible” and “also be helpful in a time of crises.” said one website for expats. Aside from generalities. I wanted to discover the shades of Israeli personality myself. I did find that many Israelis express a lively and highly extroverted vibe, but (like other dichotomies in Israel), people also manifest quiet strengths. I didn’t encounter rudeness. What were some of the quiet strengths I observed? A few included conversations of depth, a reverence for writing, staying calm and being present. Conversations of depth – Quiet influencers and leaders build relationships and go deep in their discussions. Israelis do this. Small talk isn’t the norm but it is common to engage in intense discussions about security, sustainability, and the Jewish state, etc. In vibrant Tel Aviv, thousands of families and young people strolled and relaxed at cafes. It also seemed okay to hang out alone. We were taken with the young people. Whether foreign or native-born they genuinely seem to enjoy being with each other. Sure, they were on cell phones (Israel is the home of many tech startups) but we heard LOTS of live conversations as well. Israelis have a mandatory 2 – 3- year military commitment after turning 18. The leadership training and sense of purpose young people experience gives them a maturity beyond their years. They were poised, had excellent conversational skills and knew how to laugh. A reverence for writing –. It is common for introverted leaders to figure out what they think and feel through writing, Theodore Herzl, referred to as the spiritual father of the Jewish state wrote his vision for Israel in order to understand what he believed. We also visited a beautiful area in the Negev desert called Mitzpe Ramon. A memorial, at the Ramon Crater, honors astronaut, Ilan Ramon who heroically died with 6 others in the 2003 Columbia Shuttle explosion. His words live on. Staying calm While there, we had some unexpected rain and several of the roads closed. Yael switched our plans after checking websites and conferring with colleagues. She calmly kept us updated. Fighting on the border meant we stayed away from some areas. Israelis are used to these everpresent changes and their calm demeanor is contagious. We felt safe and in good hands. 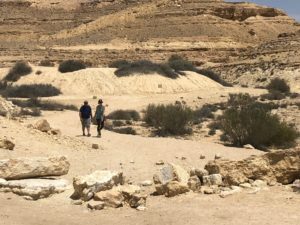 Being present – We drove miles through Israel’s desert and the vast expanse of open land interspersed with miles of breathtaking olive trees, date palms and vineyards were breathtaking. We bounced around in jeep rides with guides in the Negev desert who love their land so deeply and were keen to share that passion with us. Keeping our eyes peeled for wild boar (which we found!) in the Golan Heights, we passed abandoned old Syrian bunkers, We heard stories of fear and bravery as we met with members of a Kibbutz who live each day to their fullest. They described surviving through nights of terror and their economic efforts to save their land and communities. The people we met on our journey exhibited many qualities, and possess both introverted and extroverted traits. I was grateful that I could absorb a beautiful array of people and sights that brought these quiet strengths into clearer view. This entry was posted in Uncategorized on June 14, 2018 by Jennifer Kahnweiler.